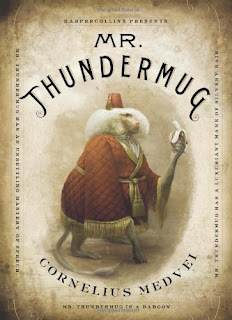 On the face of it, the idea of an animal narrator is just as sensible as a human one, and rather more attractive. One of our earliest conceits as children, and one which we might do well to cling to longer, is that everything around us is alive and sentient, and animals are more inviting-- more 'on our level' -- than adults: they are closer to our size, more affectionate, more loyal, and cuter. As a result, in books supposedly meant for children, animals talk all the time: we have Babar the Elephant, Curious George the monkey (who though he doesn't talk, is certainly the protagonist of his stories), Pooh, Piglet, and the other denizens of the Hundred Acre Wood, and many more. Somewhere around adolescence, we are meant to put away these childish things; if we persist in wanting imaginative stories set in a world other than our own, we generally have to accept that they will be populated with humans or human-like characters, and animals will be downgraded to sidekick status. By adulthood, if we persist in our folly, we are generally forced to go back and read the books we grew up with; who, after all, writes adult fiction with animal narrators? Well, quite a few people in fact, among them Virginia Woolf, George Orwell, Richard Adams, Paul Auster, and Andrew O'Hagan. Sometimes, it's a sly allegorical conceit, as with Orwell, or sly biography as with Woolf, who in Flush set out the write the life story of Elizabeth Barrett-Browning's pet spaniel. These animals, endearing though they be, are mainly figures of the human world, anthropomorphized with a particular purpose in mind. But to me, the more interesting question is, what would animals say on their own, had the but the chance and the means with which to produce speech? There have been a number of books that have gone just a bit further in imagining the animal perspective on humans, rather than the other way about. I remember reading Watership Down as a teen, and loving the way rabbits had their own language, and their own notion of humans; their word for automobile, hrududu, still slips from my tongue when I'm nearly run over by one. A similarly effective tone can be found in the feral cats of Erin Hunter's Warriors series, the first few of which (at least) are wonderfully imagined, complete with the cats' maps of their world and the human incursions within it. These are, of course, intended for younger readers, which means they can't really be on our list of ostensibly adult fiction (though of course adults may read them). So what have we? Well, for starters, there's Sam Savage's Firmin, a delightful tale of a book-eating rat who nibbles his way into a wry consciousness of the human world. Firmin, in fact, is a sort of nebbishly self-deprecating figure, which of course makes him all the more endearing as he struggles to find a niche in a world where all of his heroes -- and villains -- are of human form. 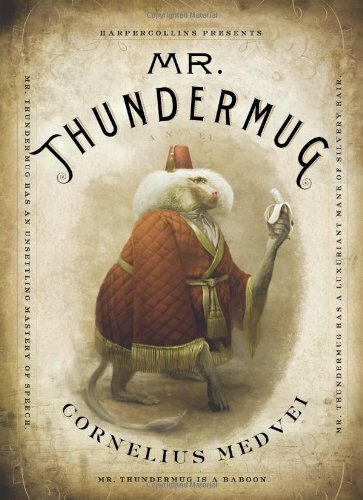 Along quite different lines, we also have Cornelius Medvei's Mr. Thundermug, a curious tale of a baboon who moves his family into an abandoned home in an unnamed city, and has a series of droll and dryly-recounted adventures, many of which consist of his struggles with human authorities, who first demand that he send his offspring to school, and then that he remove them. Alas, no one else in Mr. Thundermug's family has the gift of language, and on his departure, he still seems a lonely soul, and one we have scarcely gotten to know. There are a few other animal narrators who are based upon actual animals, and these offer some promise. Marilyn Monroe's dog "Maf" (short for 'Mafia Honey' -- he was a gift from Frank Sinatra) is given Shandyesque voice by Andrew O'Hagan in The Life and Opinions of Maf the Dog, and of his Friend Marilyn Monroe. Maf he turns out to be quite the talker; O'Hagan gives him free leash to speak his mind, and the result is strangely compelling, something that feels much closer to an articulated version of an observant dog's view of his humans than most other such tales. Other cases are not quite so strong; although it's fine that someone decided to write the autobiography of Sir Ernest Shackleton's cat, the far-faring Mrs. Chippy, the resulting book is, I fear, a one-off that's far too clever for its own good. And there are more such books, with new ones appearing every day; Howard Anderson's Albert of Adelaide, a tale of a Platypus out of water in the Australian outback, looks promising (I've just started reading it). And then there's Nilanjana Roy's The Wildings, not yet available in the US, which pits feral cats against still-more-feral cats in a far darker and more disturbing imagination of a scenario similar to that of the Erin Hunter books. Another book on my to-read list is Three Bags Full: A Sheep Detective Story, by Leonie Swann, in which the detectives themselves are sheep. I am sure there will be more such books -- many more -- and there's one thing you have to admit: no matter how many, it will be a very long time before human beings receive their due comeuppance.